Good Morning Everyone! Happy Perfect Picture Book Friday! Opening: “Once there were three little pigs. They lived on a farm, as most pigs do, and were happy, as most pigs are. Then one day the farmer told them that he and his wife were moving to Florida. He paid the pigs for their good work and sent them on their way. “Let’s buy potato chips,” said the first pig. “Let’s buy sody-pop,” said the second pig. Links To Resources: I think it would be fun to read the original Three Little Pigs, and then a bunch of other versions including Corey Schwartz’s The Three Ninja Pigs, Jon Scieszka’s The True Story Of The Three Little Pigs, Eugene Trivizas’s The Three Little Wolves And The Big Bad Pig, and any others you might come across and compare how the stories are alike and different and which elements the author chose to change or twist and how that affects the story. 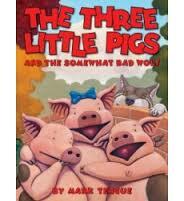 Here is a link to a lesson plan for the original Three Little Pigs. PPBF bloggers, please add your post-specific link to the list below so we can all come see what you picked this week! Oh Susanna! – Does A Similar Book Mean I Should Not Submit My Story?